We are now an official Catoosa Event and sponsored by the City of Catoosa. Time to clean up your engines and get ready for the Flywheelers Route 66 Show that is right around the corner. Route 66 Flywheelrs 2018 show will be Friday and Saturday Oct. 19 & 20, 2018. Please read carefully as somethings have changed. If you have questions regarding these changes please call and they can be explained to you. You may not drive vehicles around on the show grounds. This is for safety reasons of patrons, parade routes and displays. We have had people trying to drive through during parades and it disrupts the show. There will be barricades placed and designated parking for personal vehicles. Show exhibits such as tractors and vehicles can drive through the grounds along with golf carts/assisted vehicles. If you purchase an item and need assistance please inquire at the registration booth for assistance. *Set up day is Thursday, October 18, 2018. However, several exhibitors begin earlier in the week. You are more than welcome to come out and look around to find a place to mark off and set up for the show. Reminder!!!! Please inquire with one of the show coordinators before you park or set up in an area. We would like to keep the areas designated. Also, if you are in an area that is designated for certain items we will ask you to move to the correct area. *There will be a new display area at this years 2018 show! Travis Cottom is looking for exhibitors that would like to display their working farm equipment. If your are interested please contact him with questions. *This year we are changing the time of the Auction! Bean feed on Thursday starts 5:00 pm and the Auction to follow after dinner about 6:00.The Auction will be open to Bake goods, crafts items, Art and agriculture related items, please drop off items at the registration booth. Booth Vendors: We ask that you bring items that coincide with the theme of the Flywhleers; engines or parts for engines, tractors or parts, crafts, antiques, wood working items, tools, magazines and manuals for engine and tractor enthusiasts. We ask that you do not bring yard sale items! *Ladies! if you have crafts or handmade items let me know and we will locate you in an area that can be shared for those type of items. There will be a fee of $25 per vendor space, for a 25 foot space, (space should be within reason to accommodate the vendors beside you). You need to register at the registration booth or fill out your paperwork and drop it off before you set up your area. If you do not register before the show we will tract you down. We NEED all participants registered for the show. This is for safety reasons. (Change this year) You will be issued a colored post to be placed at your space so we know you have registered. Please be considerate of others. Thank You! Registration Booth: Opens from 8:00 am - 1:00 on Thursday, October 18th and Friday Oct. 19th from 8:00 a.m.- 1:00 p.m. and Saturday from 8:00 a.m. - 11:00. We ask that everyone either drop off there paperwork at the registration booth or find one of the board of directors or officers to assist you. 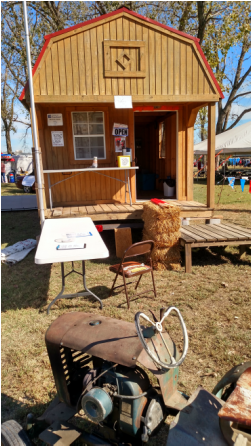 Registration is important if you want to display/operate an exhibit, you MUST sign safety guidelines to operate any type of engine/tractor! There is NO exceptions! Tractor Pulls: Will be Sponsored by Green Country this year! The tractor pulls will be on Saturday only, starting at 10:30 am. The Kiddie pulls will be available too. 50/50 Tickets will be held again this year. You can purchase them at the registration booth, or find Dorthy, Kathi or Debra during the show and we will help you out. Come on out and take a look at the show! We have tractors, hit-n-miss engines, children's games, vendors that sale all sorts of antiques and farm equipment. Great food is available to enjoy too. SHOW SAFETY is a Priority for all Exhibitors and Visitors! Jim Johnson our Safety Officer has asked that all exhibitors bring enough rope and post to secure the boundaries of their exhibits. No engines or tractors shall be left unattended while running. Please read your safety information given in your registration packet. Any questions feel free to ask. Parking will be in designated areas for visitors and exhibitors. Travis Cottom is over Parking. Please stop by and talk to him before parking where you need to park for your personal safety and that of the visitors to the show grounds. Driving around during the show is not permitted unless they are on exhibit during the show.